The simple answer is that you should get paid when someone is profiting from your labor. …However, providing content or services to a friend without being compensated does not mean that one is being exploited. If the terms of the exchange are mutually agreed upon, and if one person isn’t immediately monetarily profiting from the labor of the other, then it may well be a fair exchange, and one that is part of how solidarity and community are built within the field. W.A.G.E. advocates for equitable compensation, not for the total monetization and commodification of every aspect of our lives; we leave that to neoliberalism. How will I know if I am taking artists’ energy in exchange for an exploitative promise of “exposure”? 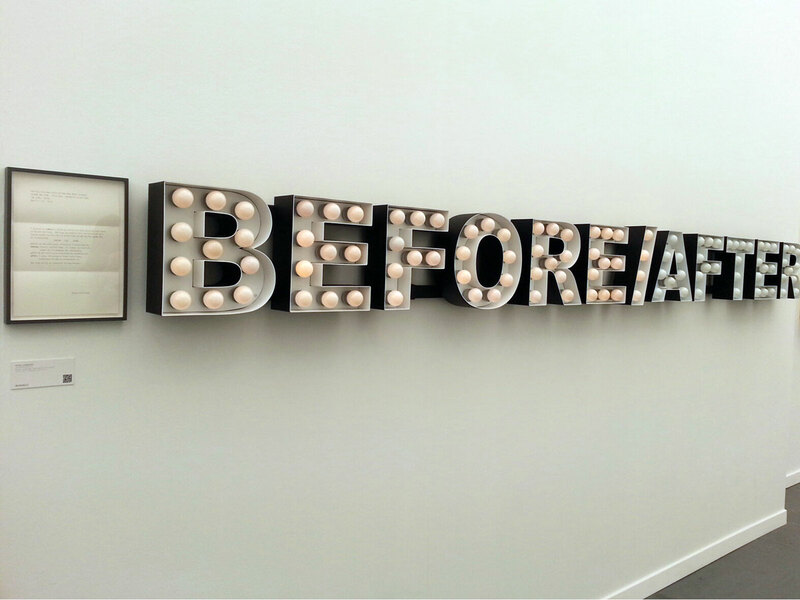 N and I were able to attend the Frieze Art Fair thanks to O (whose pass spared us each $42 entrance fees). I convinced her and M that the cross-Triboro Bridge walk would be lovely. It was, but I neglected to consider that once we got to the fair we’d be on our feet another 2.5 hours. Weary-legged and short on cash on an island where a bottle of water costs $4, I had little time or attention to really engage the artworks. Mostly, as in past fairs, I looked at methods of display, uses of materials, and forms related to upcoming projects—which now are banners and textiles. Bowers’ drawings on cardboard of Victorian icons of liberation were quite lovely, and much looser than her photo-realist graphite drawings, interestingly. 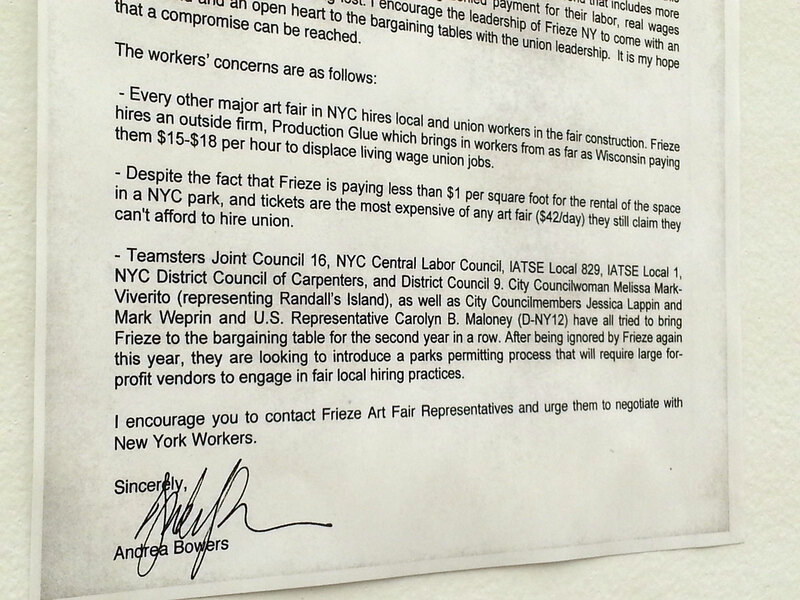 Open letter from Andrea Bowers regarding Frieze’s use of non-union labor. Photolithographic etching on copper-clad plastic by Sam Lewitt at Miguel Abreau Gallery (NYC). Having just worked on a vinyl sculpture, I thought this way of displaying floppy plastic was really smart. Handmade crochet by Servet Koçyiğit at Rampa (Istanbul). This is just pretty and in-your-face. Though I’m not sure what it means, I thought it was useful for thinking about how to frame textile text works. The crochet looks like it was treated with a glue, such as a matte medium, and pinned in place to a (removed) substrate, so it lays flat. The substrate it’s now on is a woven fabric. 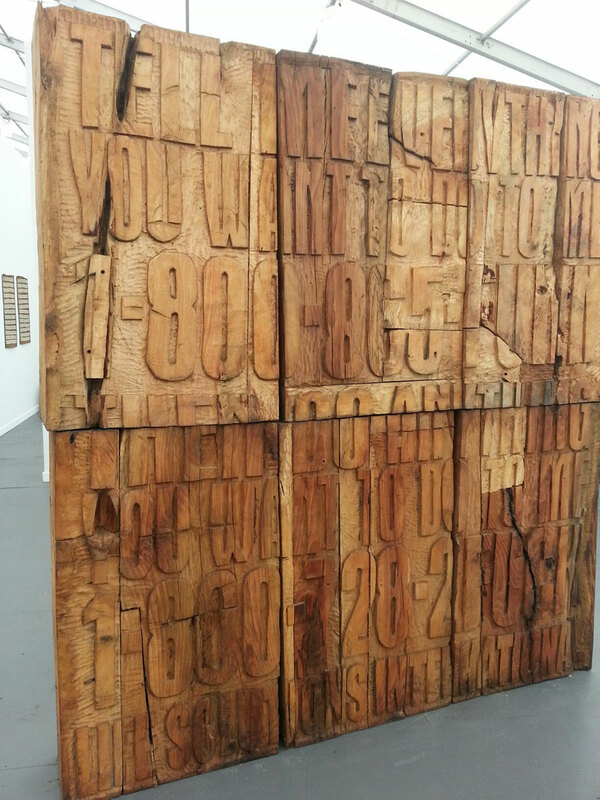 Cameron Platter‘s monumental wood text at Whatiftheworld/Gallery (Cape Town). Another puzzle in terms of content, and yes, the scale suits the obviousness of fairs. But it is pretty smart to appeal to people’s love (or fetish?) of wood type, and use condensed gothic typography. Amir Mogharabi at Ibid Projects (London). Things. On shelves. This is like a little poem, with mother-of-pearl. 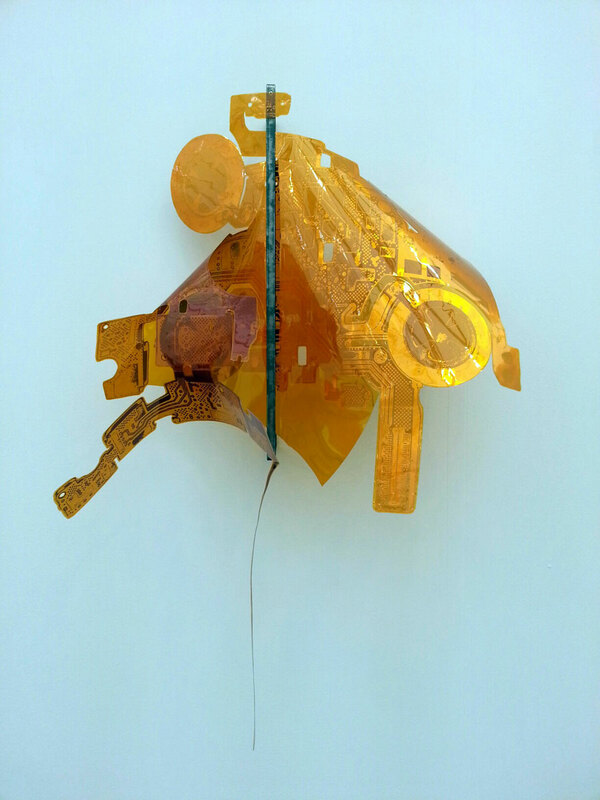 Maybe the collection of works where I could have spent a lot more time and gotten a much richer experience: Catherine Sullivan and Valerie Snowbeck’s installation of texts on laminated fabrics and sculptural works at Galerie Catherine Bastide (Belgium). The materials and typography were so unusual, and I suspect the works told a well-conceived narrative. I regret the momentum that propelled me to march onward, instead of lingering and looking more closely. Lily van der Stokker‘s installation at Kaufman Repetto (Milan). Kooky. Happy. The chest in plaid is so humorous. In working with fabric I’ve been wondering how to distinguish my work from craft—more specifically, something crafty, cute and consumable from Etsy. Van Der Stokker seems to tackle this distinction head-on with these works. 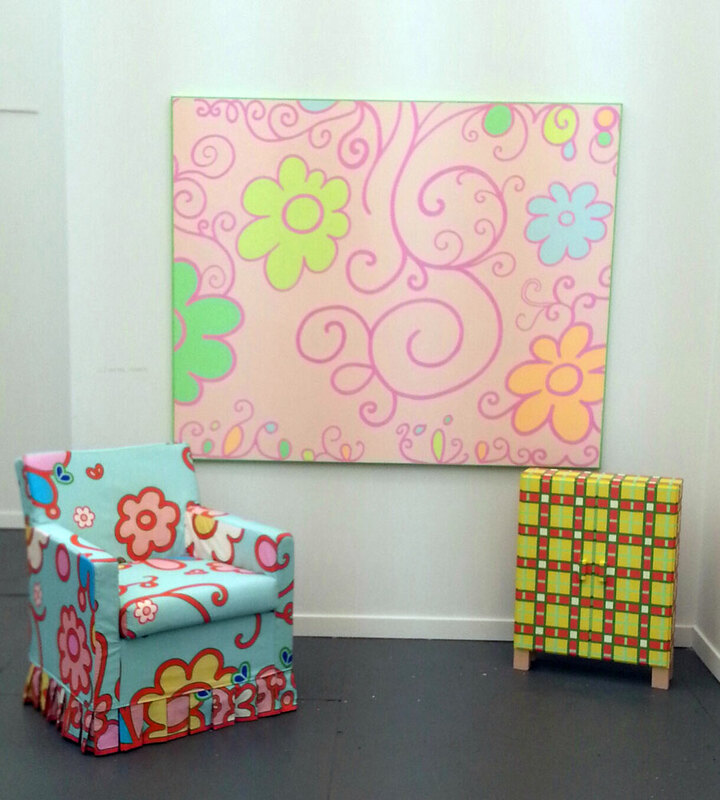 What makes a painting on canvas art, a textile design, and a painting on a cabinet any less a painting? Mmm, banners. 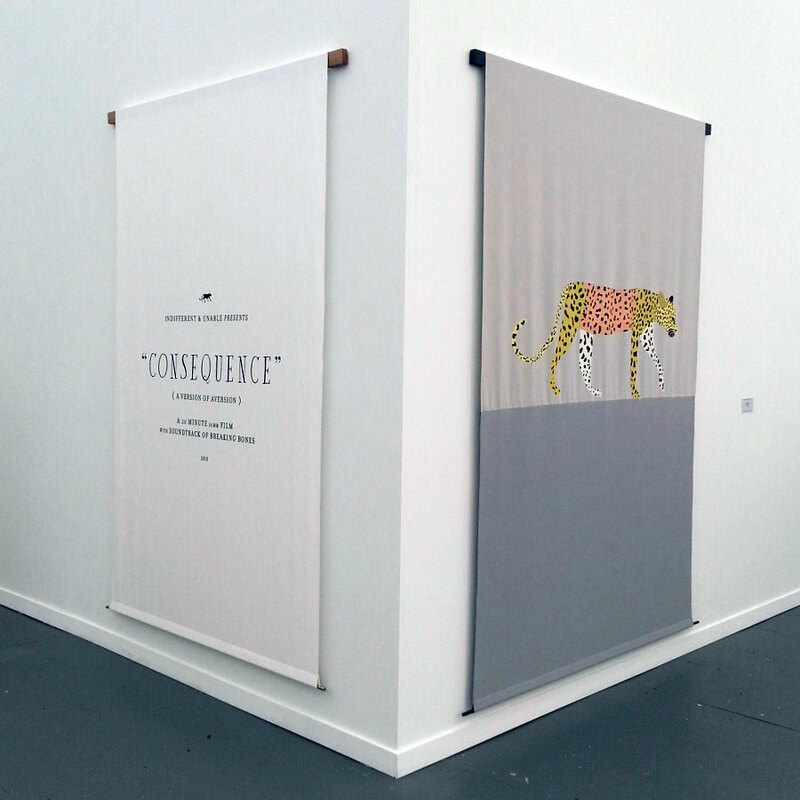 Matthew Brannon‘s banners at David Kordansky Gallery (NYC). With their stylish design, Brannon’s screenprints on paper were always charming; it’s interesting to see larger works in textiles that are also a bit more open-ended. 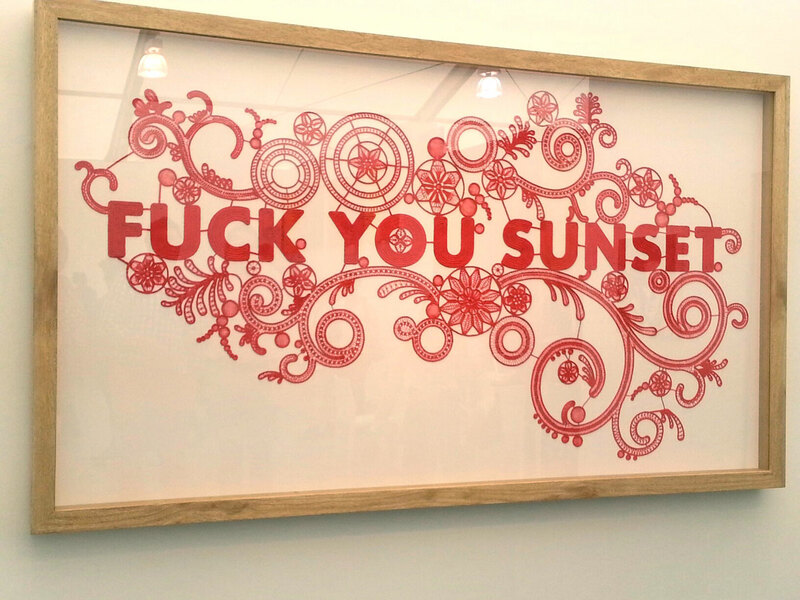 I like Peter Liversidge‘s conceptual practice. His work appears in a lot of fairs, but every project is unique to the fair, which makes the encounter a little more special for audiences. 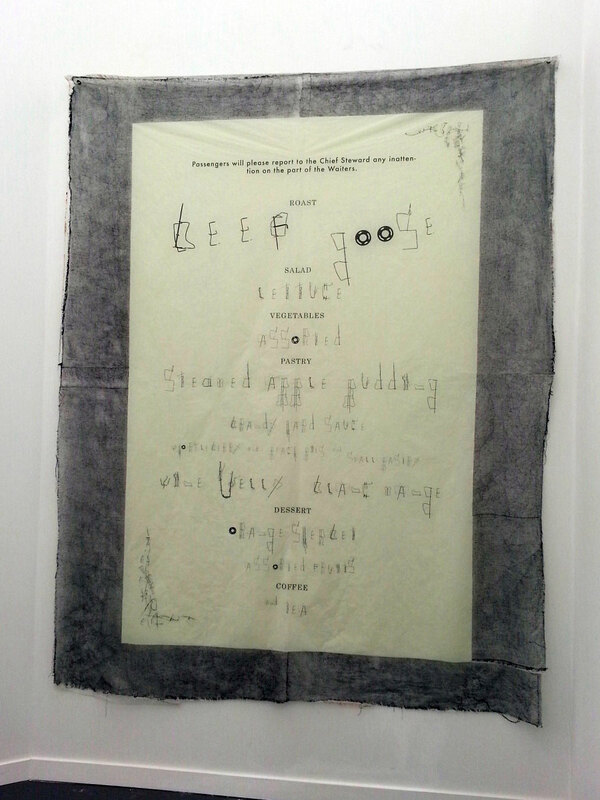 Liversidge typed the letter at left describing the work to be produced, adjacent. That this type of conceptual practice still exists is great. The fact that it appears commercially viable is interesting; it’s one of those questions that perhaps better remains unasked. At Sean Kelly (NYC). 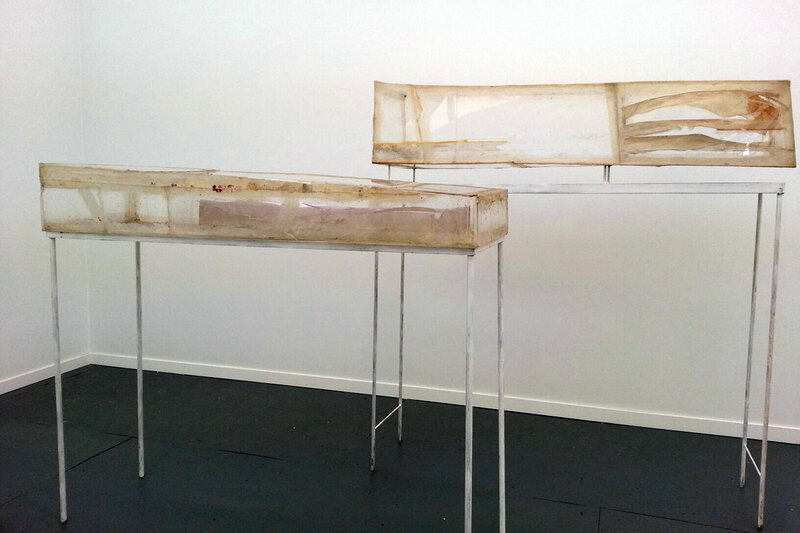 Rudolf Polanszky’s vitrines of decrepitude at Ancient & Modern (London). These worked for me, formally and emotionally. 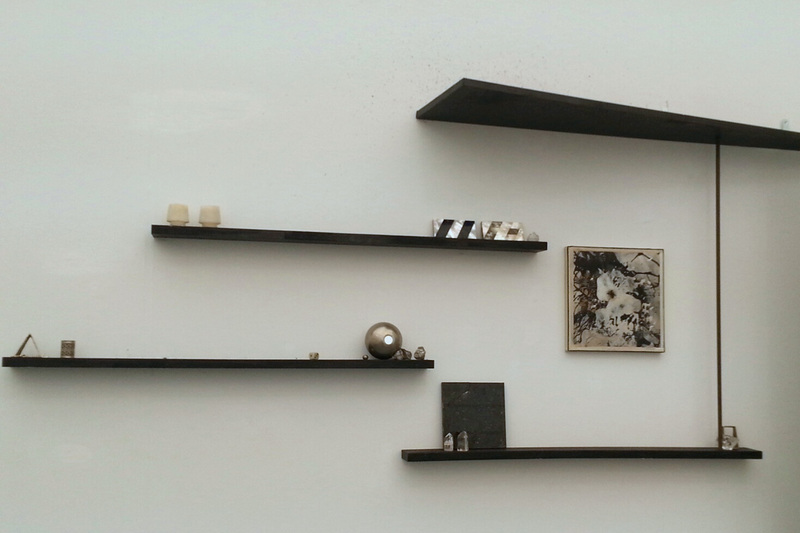 As I help M prepare his exhibition, the challenges of working with materials become instantiated everyday. In contrast to clicking “undo” and swiping screens, sourcing, handling, manipulating and displaying materials—not to mention lending them the illusion of perfection and timelessness so often desired of art objects—is complicated, expensive, and risky. Entropy constantly threatens. Nothing gets done without physical energy and attention; things take time and skill. Labor has become, as Art Monthly put it, immaterial—and I wonder how this shifts how art objects are perceived and understood. So many of my recent art viewing experiences have conjured thoughts about production values, for better or worse. The drawback, for me, is over-emphasizing how something is made over what it accomplishes in content or concept. For those who are disconnected from materials and labor, perhaps the work triggers thoughts unencumbered by human and environmental costs, at best looking with “deadpan” eyes (as Rosalind Krass described of Minimalism) at form and form alone, and at worst, with the Like/Dislike, Instagram-worthy consumer browsing. In that mindset, to register visually, to click and upload, is the power to put a thing in a shopping cart, pay for it, bring it home, and store it in a vast garage, all in one instant.